David Buchbut playing the riq. Photo courtesy of Layali El Andalus. David is the third member of this year’s guest musical ensemble, Layali El Andalus (along with Rachid Halihal and Daphna Mor). He is the group’s “beat keeper,” playing the riq, dumbek and frame drum. I would describe David as a “gentle giant” — bean-pole tall and thin with a warm smile and a quiet countenance. But, when he picks up one of his percussion instruments, all of that changes. In this year’s show you will hear David’s percussion beat strongly supporting the full company (of about 80 singers and instrumentalists) in pieces like “Seven Ways to Cook an Eggplant” and delicately bouncing along with the children’s chorus as they sing and play on stage. 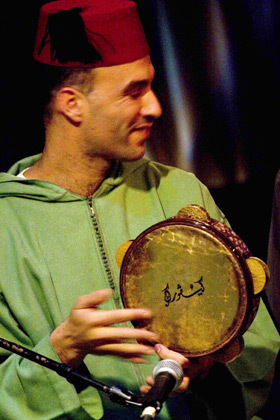 The tambourine, or “riq” as it’s called in Arabic, is actually, despite its Western connotations of preschool classrooms, a staple of classical Arabic music. Unlike kids or folk dancers who shake or clap it, classical musicians hold it vertically and still, at knee level. Like the larger bongolike dumbek, there are three major categories of sound: the “dum” the “tak” and the “kat.” But on the riq,each note can be varied not only by the tension and pace of the hand or the number of fingers applied, but also by the amount of accompanying jingle, the tautness of the drum skin and the amount of resonance the player allows any given beat or sequence. It has been an amazing lesson for me to watch and hear the many sounds that a skilled player can draw from this instrument. David has also been warm and welcoming to chorus percussionists like Guen Spilsbury (who is playing his frame drum on a couple of pieces) and our “staff percussionist” and sound effect’s man, Don Spinelli. And with five more performances remaining to this year’s Christmas Revels, you have many opportunities to come and hear him too! Rachid Halihal holding his Oud. This year we are lucky to have two specialist music groups for our Christmas Revels show. 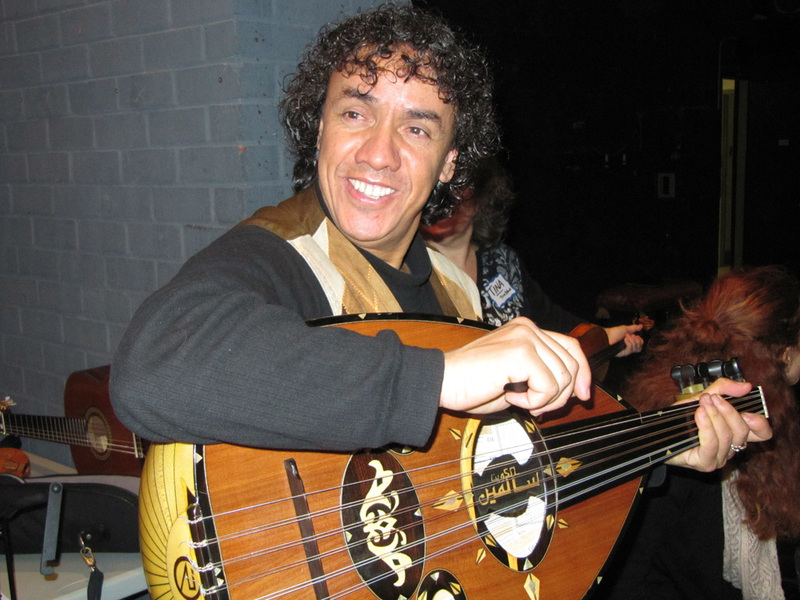 The Arab Andalus group of musicians is named Layali El Andalus and is led by Rachid Halihal. Rachid is a world-class musician who brings, to us, the true character and spirit of music from Andalusian Spain, the diverse regions of Morocco, and North Africa. As a child, growing up in Morocco, Rachid played the nei and sang, imitating the famous singers of the time. At age fourteen he entered “Dar Aadyil” the Conservatory of Music in Fez. At first he studied Western classical and Andalus music on piano and violin. He soon expanded to include a variety of other instruments in order to better express his native music. In addition to his voice, which is best featured in the Andalus style, his strongest instruments are the oud (similar to a lute without frets) and the violin, which he plays in both the classical manner and upright resting on the knee for Moroccan folkloric music. 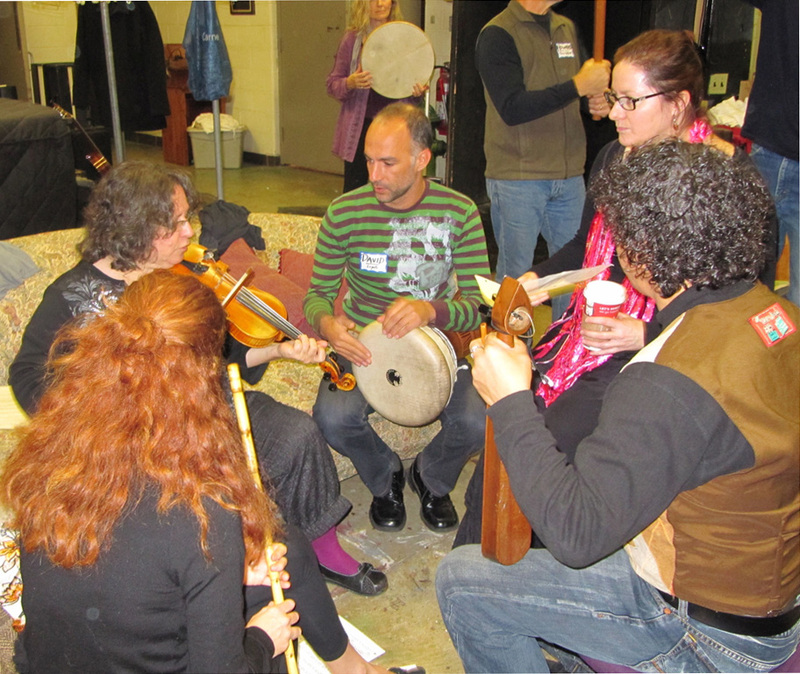 Rachid arrived this Friday evening (November 25th) from Colorado, where he was presenting workshops and concerts in Boulder and Denver. Soon after his arrival he began rehearsing with local musicians Tina Chancey (you’ll hear more about her soon) and Elisabeth Myers–Tina and Elisabeth will be joining Layali El Andalus on a few of their songs, and the Washington Revels chorus will be singing with the group as well. Learn more about Rachid by visiting his Web site (rachidhalihalmusic.com). And, visit the Layali El Andalus band Web site to learn more about his group (ayalielandalus.com). We are so excited to have them as part of this year’s Christmas Revels. Every year, The Christmas Revels has a different theme. Those themes bring different languages with them. And different languages have different levels of difficulty. Before this year, the toughest show I’d been in for languages was the Scandinavian show in 2005, when we sang in Norwegian, Danish, Swedish, Icelandic, and Finnish. Actually, that one wasn’t all that hard for me because I speak a little Norwegian, and once you know Norwegian, you basically know Swedish and Danish, too. They’re all very closely related. Finnish, on the other hand, isn’t even Indo-European (the language group that includes English, French, and a whole slew of languages from Russian to Hindi). 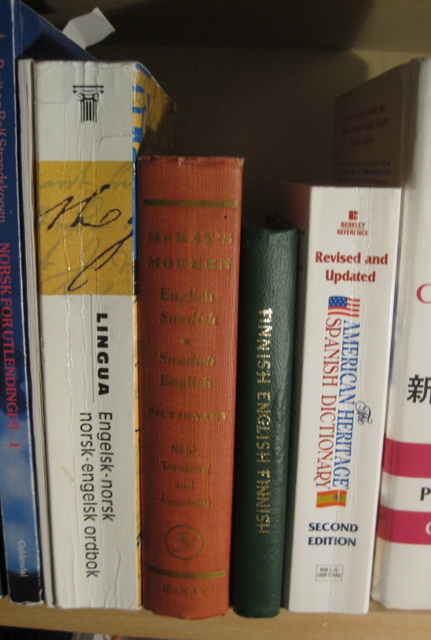 Finnish is Uralic, the family that includes Hungarian and Estonian. For the songs in Finnish, I was basically memorizing nonsense syllables along with everyone else. This year’s equivalent of Finnish is Arabic. We’re only singing three songs in Arabic; mostly we’re singing in Spanish and a few other languages that are closely related to Spanish. I don’t speak Spanish, but it’s reasonably familiar, and I can look up the words I don’t know in a dictionary. But with Arabic, I’m lost. We’re given translations, so I can find out what the songs are about, but I don’t know the individual words. This makes memorizing the songs extra-challenging. I’ve come up with little stories based on what the words sound like, or words they remind me of in other languages. A line in “Qum Tara” reminds me of the Norwegian for “I got some tuna,” for example. It reminds me of when I taught English in Japan – Japanese doesn’t have an “L” sound, and the “R” sound falls kind of in between our “L” and “R.” One time I was teaching a private lesson on directions, and I discovered that when I told them “turn right at the light,” the words “right” and “light” sounded exactly the same. I showed them the difference in how I form the two sounds. They could see it, but they still couldn’t hear it. So, now that I’m singing in Arabic, I think I understand a little bit of what those Japanese students were dealing with. We’ve been told how to handle the Arabic vowels, so don’t worry. I don’t know that I’m going to be able to produce exactly the right vowel, but at least I know how to make that pesky “eh” sound so that it doesn’t sound totally wrong.